My original thesis has recently been published as a book by Lambert Academic Publishing AG & Co (www.lappublishing.com). One of the key skills required by project managers, in fact all managers, is the ability to motivate team members and the wider stakeholder community. Most business approaches to motivation are based on extrinsic motivators – if you achieve ‘A’ we will reward you with ‘B’ and if you are really good and make ‘2A’ we will give you ‘2B’. The theory used by business is based on the assumption the larger the reward the greater the motivation; provided basic principles such as fairness are applied and the reward is commensurate with the effort needed and expectations of the person being motivated. It is assume the increase in motivation will flow through to increased performance. Management scientists way back to Henry Gantt had established that in the ‘carrot-and-stick’ approach to motivation, fear and the ‘stick’ had little effect, the ‘carrot’ and reward had measureable effect. However, these studies were applied to manual workers. More recent work by researchers such as Hertzberg in his ‘Hygiene Theory’ (1959) and Maslow’s pyramid of need (1943) placed salary (wages/reward/income) relatively low down the list of motivators. As long as the ‘pay’ was what was expected it had little extra value; inadequate rewards could quickly de-motivate, but once adequate levels were reached ‘pay’ simply came off of the table. This is a basic part of our PMP courses, hardly new or exciting…. However, I have just watched a fascinating video on TED, by Dan Pink, on the surprising science of motivation: starting with a fact that social scientists know but most managers don’t: Traditional rewards aren’t always as effective as we think. A brief summary of the presentation is that traditional rewards do work for simple manual tasks. However, as soon as creative thinking is needed extrinsic rewards have the opposite effect by focusing effort in a narrow band and stopping the more creative thinking needed to solve the problem. The results are measurable negative performance, increasing as the reward increases. Autonomy: control and self-direction over the work. Mastery: the ability to excel at the work by getting better and better at difficult tasks. Purpose: the work contributes value to the organisation and others (in the service of something larger). These motivators are very similar to the ideas of Maslow and Hertzberg briefly discussed above, and McGregor (Theory X, Theory Y – 1960). What’s fascinating in Pink’s presentation is the fact most organisations reward their senior decision makers with huge pay bonuses to solve some of society’s most difficult problems (and wonder why they fail so often…). To see the presentation, go to the TED website at: http://www.ted.com/talks/lang/eng/dan_pink_on_motivation.html – whilst there it is well worth browsing, there are dozens of other fascinating presentations. Working on my paper for PMOZ 2010, Seeing the Road Ahead – the challenge of communicating schedule data has required me to re-visit two key papers and augment them with new information and materials discovered in the last few years. A Brief History of Scheduling – Back to the Future has had quite a lot of new materials incorporated. I am now confident this paper accurately lays out the development of scheduling and in particular, the origins of PERT and CPM. The Origins of Modern Project Management has had a few new footnotes included an links the development of modern project management to its roots the the spread of scheduling in the early 1960s. Both updated papers are available for downloading and I have most of the reference materials available for anyone interested in further research into these topics. Methodologies define a step-by-step process for delivering projects. Each methodology will describe each step in adequate depth, so that the project team understands what has to be done to deliver their project. This is quite different to a standardised knowledge framework such as the PMBOK® Guide (for more on this see: PMBOK -v- Methodology). By using the same steps for every project the organisation undertakes risks and uncertainty are minimised and there is likely to be an overall saving of time and effort on projects. Define what it is that you want from your methodology, the type of content it should contain and the way in which it will be used. How much detail should be included? What practical templates and examples are needed to help to complete the step quickly and easily? Should it follow one of the worldwide project standards such as the PMBOK® Guide? Can/should the system be easily customised suit all project types and sizes? Review the methodologies used currently by your organisation and compare them to your requirements to see if there is a good fit. Review the commercially available methodologies to see if there is a good fit. The best methodology is still only likely to have a 90% fit (or less), this is normal. Make sure you can customise the remaining elements to meet your requirements. Ensure adequate flexibility for the range of projects in your organisation. Create an Implementation Plan supported by a change management plan. Implementing a methodology is a significant organisational change. Run the implementation as a change management program, including customising the methodology for your environment. Stakeholder engagement is vital to the overall success of the initiative. Train the users and support staff in the methodology and ensure ongoing support. Ensure the methodology is followed. Start improving the methodology (for more on measuring and improving the organisations project management maturity see Mosaic’s OPM3 home page). Processes are always capable of improvement. Observing the actual implementation of the methodology will define actions and outcomes within the following matrix. Unauthorised, unproductive activities need to be stopped and authorised productive processes supported. The two zones for process improvement are refining or removing elements of the methodology that do not add value to the overall management of the project and incorporating unauthorised processes that are not in the methodology but that are being used add value. The easiest and most important area for action is rectifying the unproductive processes already in the methodology. Care need to be taken to ensure the definition of ‘unproductive’ is understood. Most planning processes don’t produce anything and consume effort; superficially they can be classified as ‘unproductive’. In reality, effective planning contributes significantly to the efficient delivery of the project and its value to assist in the efficient execution of the work being planned is significant. Excessively detailed planning though is usually counterproductive. 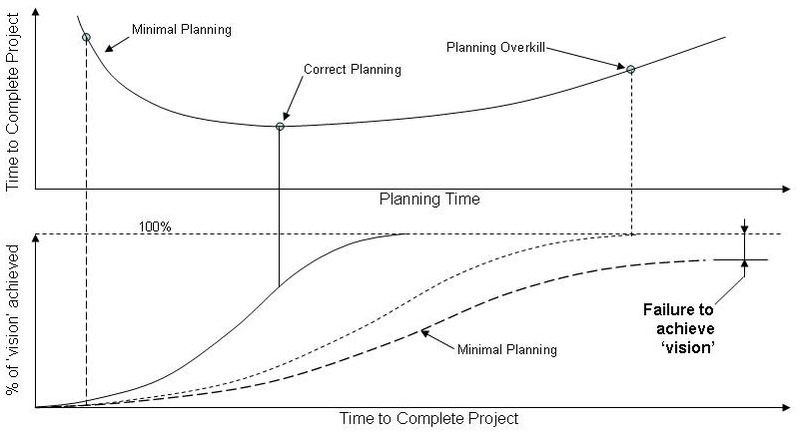 Value judgements are needed to assess the point at which adding more detail or rigour becomes ‘planning overkill’ reducing the overall value of the process and conversely, how much detail can be safely removed from a planning processes to improve overall productivity before insufficient planning starts to cause problems. Ensuring the methodology is seen as ‘productive’ is essential for it to be generally accepted and supported by your stakeholders. Once the existing methodology is optimised and firmly in the ‘authorised and productive’ segment, the next area is to examine unauthorised processes that aid productivity and progressively incorporate these into your methodology. The ‘unauthorised and productive’ quadrant is where you find genuine innovation and opportunities for organisational gain. No methodology works ‘out of the box’ they all need customisation and tailoring. However, the effort is worthwhile. OPM3 has demonstrated standardised processes that incorporate best practices can provide significant benefits to an organisation (see more on OPM3). The challenge is balancing systemised processes with the need for adequate flexibility to deal with the circumstances of each unique project. An effective project management methodology needs core components, scalable components and optional components designed to meet the needs of your organisation.